Food and Fashion, the perfect combo if you ask me. 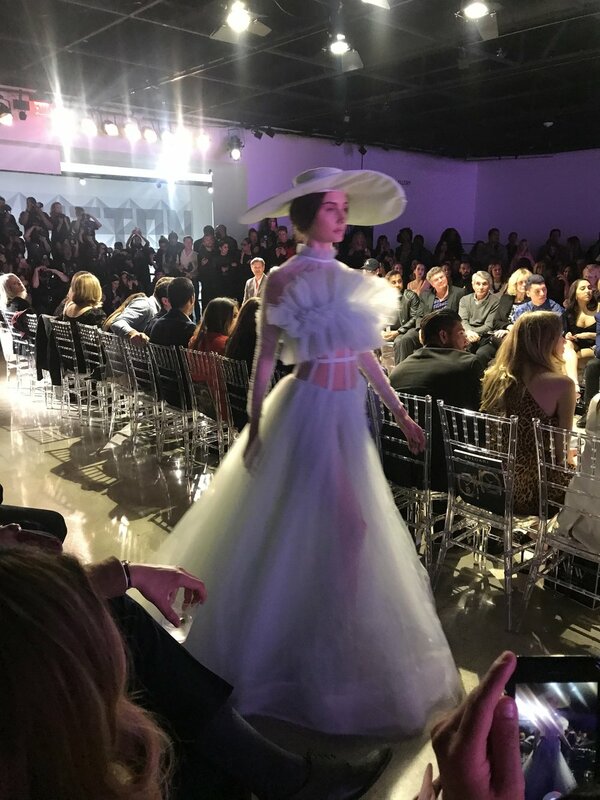 That's why I was absolutely thrilled to attend Day 1 of LA Fashion Week this year. There were three tiers of tickets one could purchase. General admission which started at $70, and $250 for the VIP ticket to have access to both the after party and dinner. The event was held at the Petersen Automotive Museum, you're probably more familiar with it if I say 'that big red and silver building on Wilshire Blvd.' Oh, they also hold some of the rarest and most valuable cars in the world, no biggs. Drago Ristorante, started by the four Drago brothers, offers elevated, yet authentic Italian fare. I was lucky enough to be able to participate in the dinner at Drago Ristorante prior to the event. With a newly built outdoor patio, and extended dinner hours, exotic cars, I call that a perfect Sunday. To start, we ordered the Vitello Tonnato. 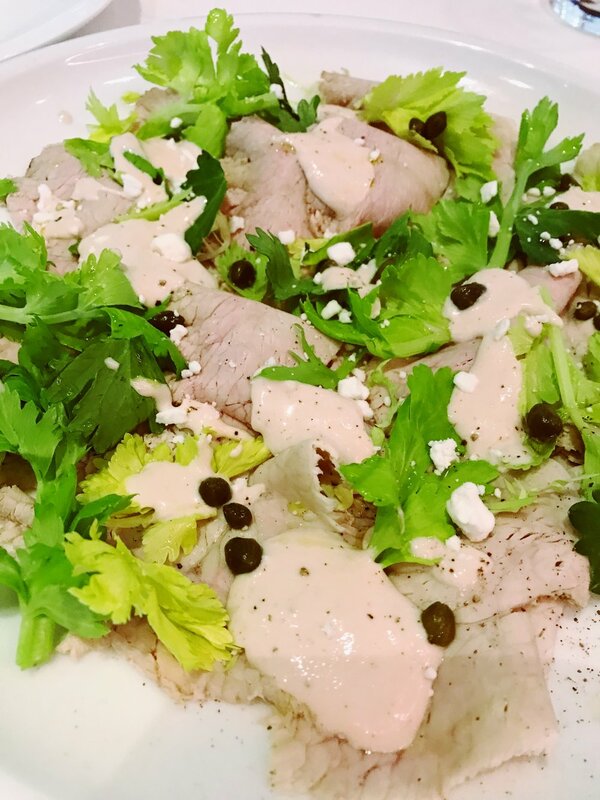 Thinly sliced pieces of veal topped with celery leaves, cracked pepper, and a delicious creamy sauce. I personally topped that over their homemade rustic bread and have to admit it was pretty damn good. A unique dish too. Did you even do Italian food if you don't order pasta? I think not. That's why we ordered two of them. My favorite of the two was the Pappardelle Al Sugo Di Chinghiale, wild boar ragu with wide fettucini. The pasta is homemade and you can really tell the difference. It's so fresh and absolutely delicate. I would recommend this one. The second pasta is called Mezzelune Di Zucca Alla Mantovana. Half moon shaped ravioli filled with squash and truffle sauce. The truffle sauce is what excited me. I kind of imagined that anything in truffle would taste good. While the sauce and ravioli had a nice delicate flavor to it. While it was tasty and slightly sweet from the squash, I prefer a more savory and meaty dish. But that's just a personal preference. If you are vegetarian, or just happen to like the simple sweetness of squash, than you will love this dish. For our third course, we went with the branzino, pan seared sea bass. This was magnificent. I love branzino and sometimes the side dish can be done wrong but theirs came with Sardinian cuscus with clams, tomatoes and turnips. I recommend this as well. For dessert, the dish that stood out the most was the pannacotta allo yogurt, salsa anice e arance. Greek yogurt pannacatta, star anise, and orange sauce. Lightly sweetened and perfectly balanced with the freshness of the strawberries on top. This was a winner all around. After dinner, it was time to head upstairs to where the fashion show was to be held. The first show was the Walter Collection, and the power pink definitely came to play. Gorgeous models strutted the runway in all the pink and sequins one could want. The second show was Naeem Khan. Seventies/Gia inspired designs graced the runway in fun outfits that made me wish I could go home with all of them. I was definitely born in the wrong era. I'm a 70s fashion baby all the way. The fashion show ended with the after party held on the penthouse floor. I met so many awesome creatives alike. Can't wait for next year! Are you more of a go for the fashion, or go for the food person? Tell me below!